KANSAS CITY, Mo. – The onset of World War I brought about unparalleled advances in technology and heightened global relations, while leading to a permanent alteration of the human perspective. As a result, new perspectives on music, literature and art emerged. Images of the Great War: European Offensives 1914-1916, a new special exhibition at the National World War I Museum and Memorial, showcases an array of artwork from the early European theatre (beside image: Attaque de bersaglieri italiens contre les troupes autrichiennes sur les hautes et âpres montagnes de l'Isonzo by Cesare Tallone). 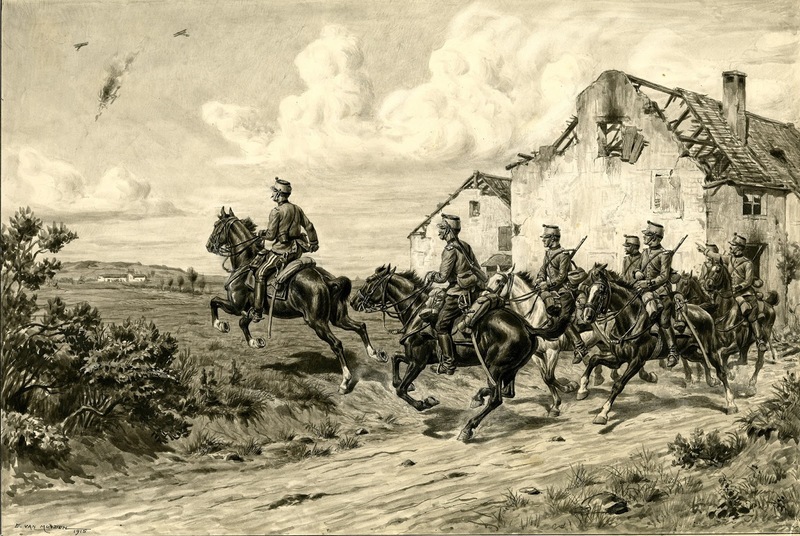 Opening Tuesday, March 29, Images of the Great War: European Offensives 1914-1916 presents art from the first two years of World War I, highlighting two differing styles of art from the period. Many of the works in the exhibition are representative of the modernist movement arising from the war, detailing the fighting in abstract terms. Conversely, much of the art of the time presents the war from a realistic perspective, harkening back to 19th century styles. The exhibition features art from eight different countries: France, Britain, Italy, Germany, the Netherlands, Austria, Turkey and Switzerland. Works range from those created by professional artists of the time as well as sketches done by soldiers on the front line. 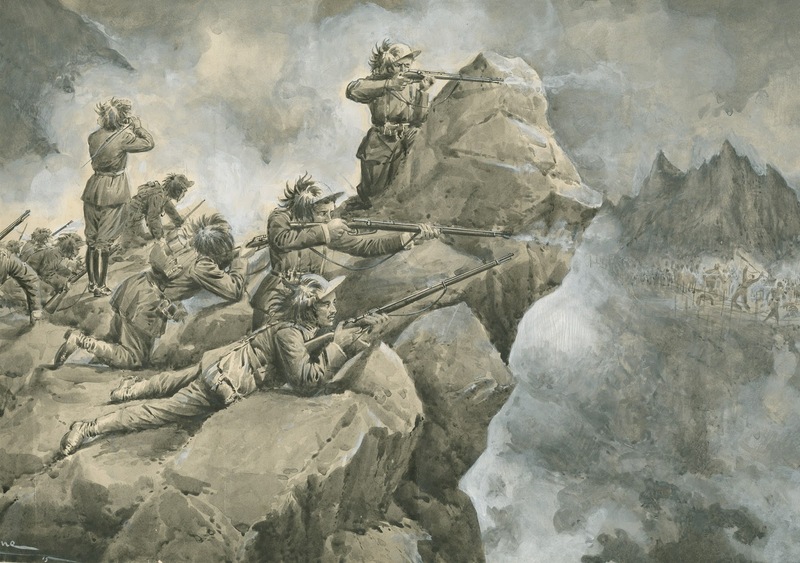 Much of the pictorial art included in the exhibition is similar to what was seen by the wartime masses through the illustrated press, and played a large role in determining public perception of the war (beside image: Chute d'avion by Evert van Muyden). The exhibition was organized by Brown University Library and The President Woodrow Wilson House, a National Trust Historic Site, Washington, D.C., curated by Peter Harrington & Stephanie Daugherty and sponsored by the Abend Family Philanthropic Fund. The exhibition, located in the Research Level Gallery at the Museum, runs through Oct. 9, 2016. 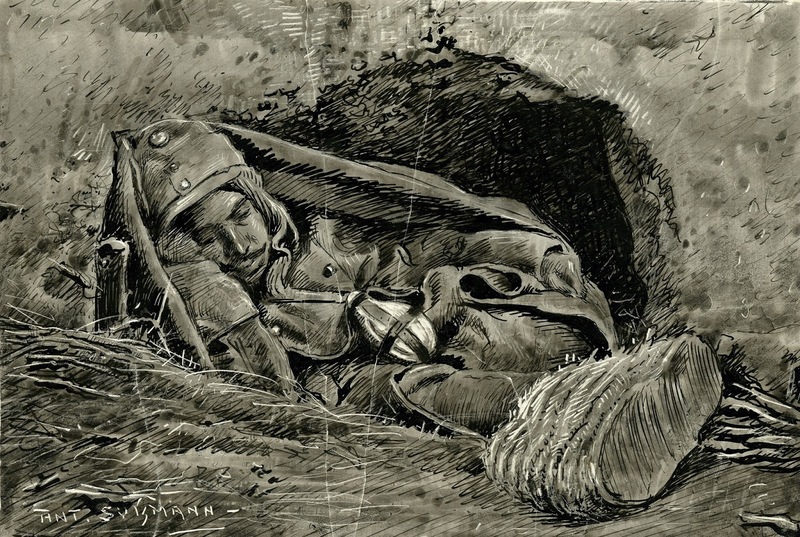 The National World War I Museum and Memorial holds the most diverse collection of World War I objects and documents in the world and is the second-oldest public museum dedicated to preserving the objects, history and personal experiences of the war (beside image: Infantryman asleep in cave shelter by Anton Sussman).